There are few television programs as famous as M*A*S*H. Few sitcoms have run as long, won as many awards, or garnered so much critical praise. M*A*S*H did all these things and it did them in a special way: combining comedy with drama to make viewers not only laugh but feel. From the day it premiered in September 1971, M*A*S*H broadcast its unique blend of humor and emotion each to the viewing public. The series wrapped up with a movie-length series finale in February 1983 that remains to this day the single highest-rated, non-sports TV broadcast in the United States. M*A*S*H surely is the finest kind. This website is dedicated to preserving and exploring the history of M*A*S*H, from the original fall preview broadcast in September 1972 to the obscure animated parody and everything in between. Researched articles on a variety of topics are complemented by rare photographs and video footage. I’ve also compiled an exhaustive broadcast history recounting every episode, pre-emption and repeat aired during M*A*S*H‘s original run on CBS. This website has been around in one form or another since at least April 1999. It’s possible that the earliest version of the site was actually online in 1998. During those early years, it was a general “fan site” featuring an episode list, pictures and sound files. The site bounced around between free web hosting services like Xoom, GeoCities and FortuneCity. In early 2001 it moved to Tripod and shortly thereafter was upgraded to the paid Tripod service–meaning there were no longer advertisements. The name of the site was changed to M*A*S*H — Finest Kind in February 2002. It moved to its own domain (www.finest-kind.net) in October 2002. A relaunch in April 2004 shifted focus to exploring the history of M*A*S*H. In January 2009, the site transitioned to more of a blog format utilizing WordPress. 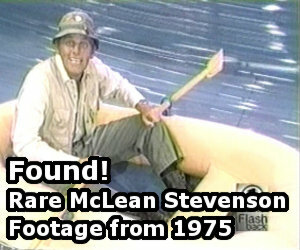 I introduced the Name That Episode game in April 2009, which challenges fans to identify random images episodes of M*A*S*H.
In May 2011 the name of the site was changed to MASH4077TV.com and it moved to its current domain (www.mash4077tv.com). I started reviewing a random episode of M*A*S*H every Monday in January 2013. I should make it through the entire series by October 2017. The earliest complete version of the website in existence–transferred from computer to computer over the past 16 years–dates from September 2000. Believe it or not, I didn’t watch M*A*S*H during its original 1972-1973 run on CBS. I actually wasn’t born until a few years after the series went off the air. I was introduced to M*A*S*H in 1998 when it began airing on cable channel FX and quickly became a fan. You can read the story of My First M*A*S*H here. For the record, I’ve never met any members of the M*A*S*H cast or crew. Nor do I have a huge collection of M*A*S*H memorabilia. I own most of the books about the series as well as a complete set of the 1982 Donruss M*A*S*H trading cards, an original 1983 CBS poster commemorating the series finale, some CBS press photographs, and a few other things. I don’t watch M*A*S*H every day but I have seen every episode two or three or four times.